Products • Stroberg Equipment Co.
A self-supporting structure constructed from an extremely strong, quality steel. The panels are easily used on all types of terrain including uneven ground—leaving a minimum gap between the panels. 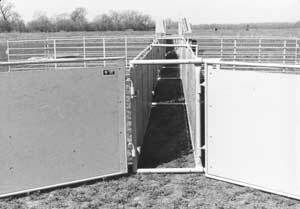 Also, the unique construction of Stroberg panels keep cows and calves from trying to go underneath. The panels are completely welded around the horizontal bars and joints. Extra time taken in welding workmanship insures added strength. 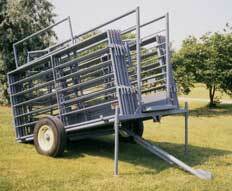 The corral is transported on either a panel trailer or combination panel trailer/loading chute. 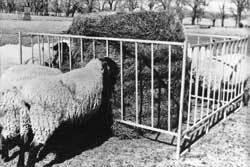 The Sheep Corral will hold up to 1500 ewes or 1000 ewes with lambs. 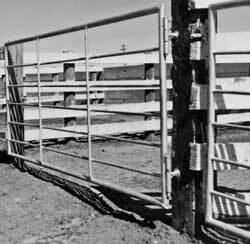 The corral consists of 13' tandem chute, 39 pipe panels, 12 solid panels, 2 dodge gates, and three adjustable alley frames. All panels are 12' in length and 40" in height. 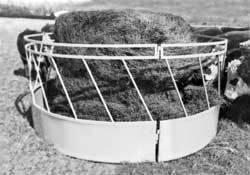 Stroberg Hex Hay Feeder for sheep or calves. The floor is 6" up so can be used for grain feeding. It comes in 2 sections and has 14 openings. Unique design makes it easily moved to different locations. Stroberg Round Bale Feeders come in 3 sections. Each feeder has 21 feed openings, no wasted space, heavy construction, (note double ring at top), sheet metal at bottom for minimum hay loss, can be used for regular bales or other roughage. Larger 8'6" size allows loose feed to drop into void between bale and feeder skirt thus reducing waste. The time required to open and close poor, rickety gates can be used more profitably elsewhere. Constructed of superior steel and precision welded in standard Stroberg style, Stroberg Gates will last a lifetime and make your work handling livestock go faster, easier and safer. Stroberg Hinges with threaded and adjustable hanging pins make a Stroberg Gate easy to hang and easy to keep balanced and free swinging. Ask about our optional selection of gate latches! We also custom build to fit your exact opening. Farm Gates hanging from Stroberg H-Braces make a good-looking entrance. Stroberg Continuous Fencing is constructed of 14 ga. 15⁄16" tubing in 10'6" lengths with 6 bars horizontal and 3 bars vertical. Connectors are welded in the end. 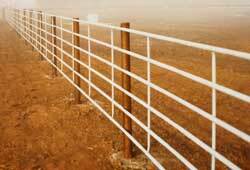 5-Bar and 7-Bar fencing also available. 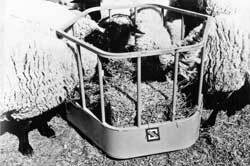 Built for service—the Stroberg Big Bale Feeder can be used for calves and sheep. The feeder is built for years of service using round and square tubing. The feeder is 8' square and comes in 4 sections. 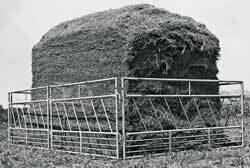 Two sides slide in so animals can eat the entire bale. One person can assemble it or move it in a few minutes. Feed costs are reduced when you use Stroberg Slant Bar Feeder Panels—they reduce time and labor as well. Stroberg Panels are strong enough to withstand the punishment of the heaviest animal. 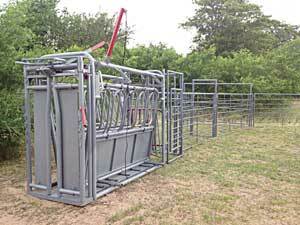 In addition to being used as feeder pens, these strong, sturdy panels can be used as fence line feeders, portable corral, catch pen or gate. 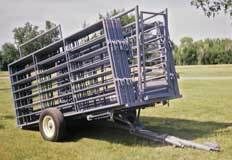 Feeder panels are easily returned to a rectangle, ready for a new stack, round bales or large square bales of hay or feed. 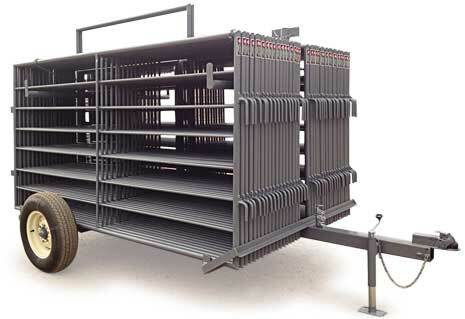 Ask about our various lengths of feeder panels. 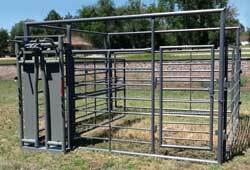 The Stroberg Calving Pen is a very important piece of equipment at calving time. Its use as a pen is not limited to calving—it works great to restrain for other purposes. Our fleet is devoted entirely to giving Stroberg customers fast, dependable service!